Welcome to TheReadathon! I am so excited to welcome you to my new site! You’ll notice that most everything is the same, but the new address is much easier to find! This new site is also much more up-to-date, has greater functionality, is much more simple, and there’s room to grow. I have so many great things planned, and I can’t wait to get started! To launch this new site with a bang, I have a give-away! 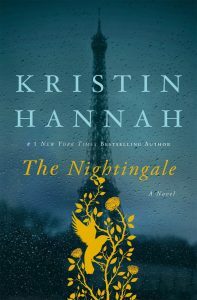 I’m giving away a copy of The Nightingale by Kristin Hannah! To Enter, all you need to do is subscribe to my newsletter! When you subscribe to my newsletter you will get a copy of “15 Ways To Get Kids Excited About Reading” and you’ll be entered into the drawing to win The Nightingale! The subscribe form is right below; it’s also in the right sidebar and at the very bottom of the page. Super easy! I’ll pick the winner Friday morning. Also, check out my review of Check Me Out by Becca Wilhite, right under this post; it’s new this morning!